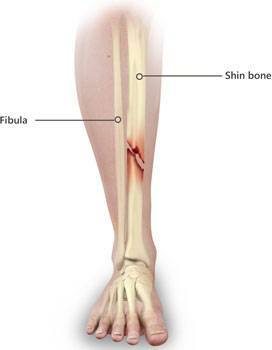 Fractures of proximal tibia: A proximal tibial fracture is a break in the upper part of the shinbone or tibia. Proximal tibial fractures may or may not involve the knee joint. Fractures that enter the knee joint may cause joint imperfections, irregular joint surfaces, and improper alignment in the legs. This can lead to as joint instability, arthritis, and loss of motion. These fractures are caused by stress or trauma or in a bone already compromised by disease, such as cancer or infection. Proximal tibia fractures can result in injury to the surrounding sof t tissues including skin, muscle, nerves, blood vessels, and ligaments.